There’s a buzz of festive cheer around Herefordshire! Everywhere you go you see the sparkle of tinsel and fairy lights lining shop windows. The smell of freshly cooked gingerbread coat the frosty winter air. The late night shopping season has begun! If you are planning on doing your Christmas shopping in Hereford, then you will be happy to know that we are open throughout the festive period… We have compiled a list of our Christmas opening hours (so that you can pick and chose when to come and see us!). 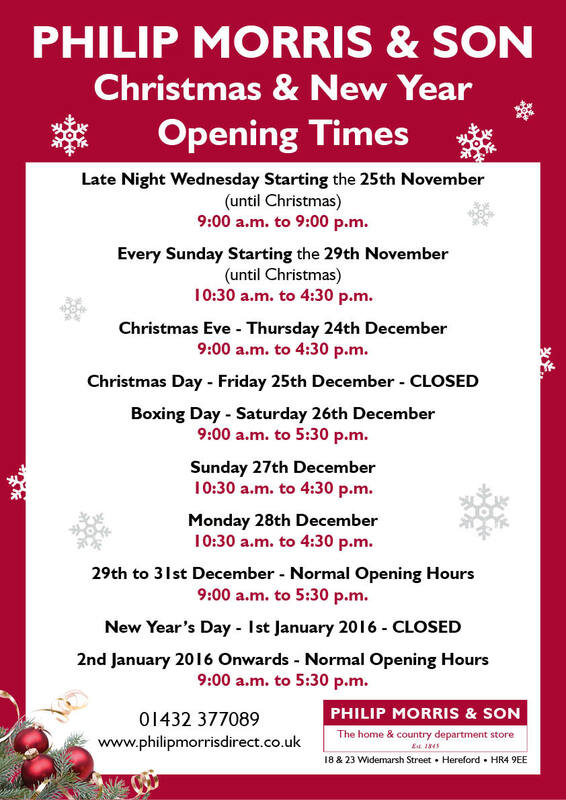 Boxing Day, Christmas, Christmas Day, Christmas Eve, Late Night Shopping, New Years Day, Opening Times, Philip Morris, Philip Morris & Son. Bookmark.